There's something about this season that makes me both want to make something crafty and to work to create an inviting environment at home. So, last weekend I thought I would combine both of those desires and make an Autumn Wreath for our front door! I searched the aisles of Target and browsed online for Autumn wreaths to purchase, but I just couldn't find one that I liked. After looking at lots of Autumn craft ideas on Pinterest, I was inspired by these two wreaths to make one of my own! I didn't take step-by-step photos of the process, but it's pretty easy to do! Take your yarn, and hot glue the end to the back of your wreath form. Wrap the yarn around and around and around. (This step can be very time consuming...approx. 2 hours...so I found it helpful to watch something delightful, like Newsies, while I was wrapping away.) Don't worry about being too perfect with this. My perfectionist self was way too precise to start off with, but as I went along I got more lazy and it still looked about the same. Continue to wrap until your entire wreath form is covered! You may have to cut the yarn and re-glue a new piece, and that's okay! Just make sure to always glue on the back of your wreath form. 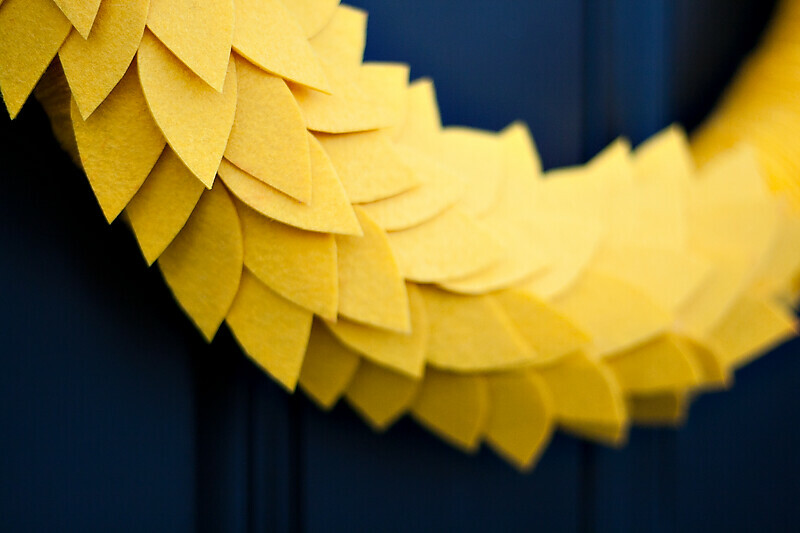 Take your stiff sheets of felt and sketch out a leaf. Cut out that leaf, and then use it as a guide to sketch out a bunch more! Hot glue your leaves onto your wreath. Voila! 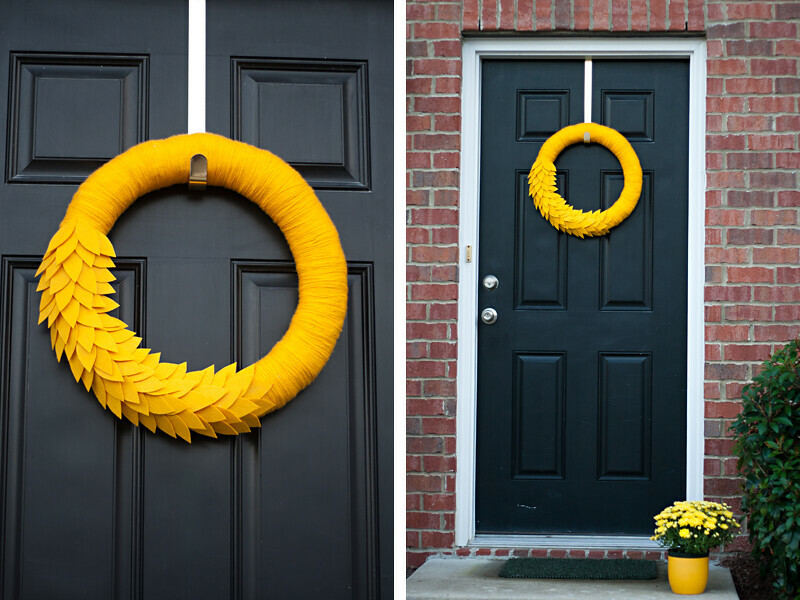 You have yourself a neato Autumn Wreath. Pat yourself on your back and go hang up your wreath smiling with satisfaction at a job well done! Here's a glimpse out our doorstep. It looks much more welcoming than when we first moved in, which makes me happy. 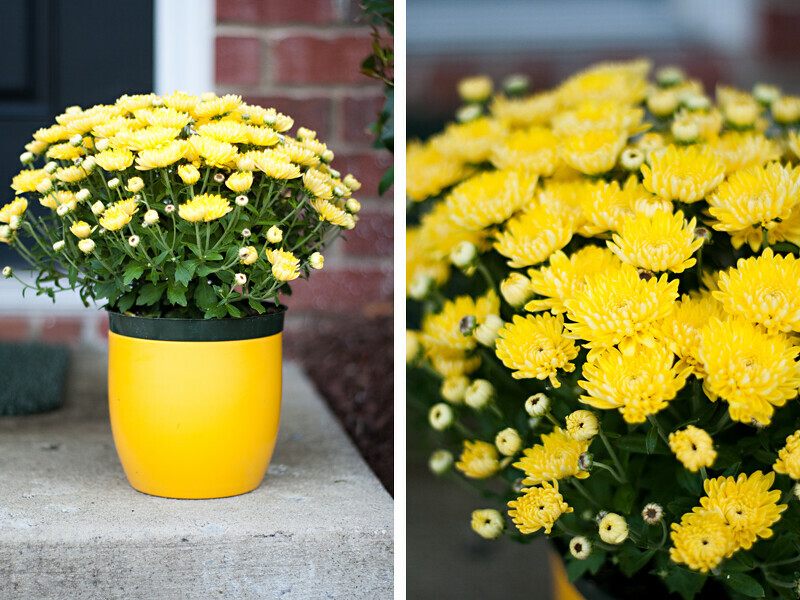 Husband bought me those yellow mums yesterday. I love them! Now all we need are some pumpkins...and a welcome mat! One like this, perhaps? Welcome mats are yet another thing that I have a hard time finding ones that I like. They're either blah, not our style, or too pricey. I may just have to make my own! If you have any questions at all about making your own wreath, please don't hesitate to ask! And if you make your own, I'd love to see! Feel free to post a link in the comment section. Have you made any Autumn crafts lately? Please do share. Happy Autumn Day to you! it's lovely, i'm thinking i might want to take a whack at it. you should make your own welcome mat! there is so much cute inspiration on pinterest too, sherry at younghouselove has pinned a few cute ones. 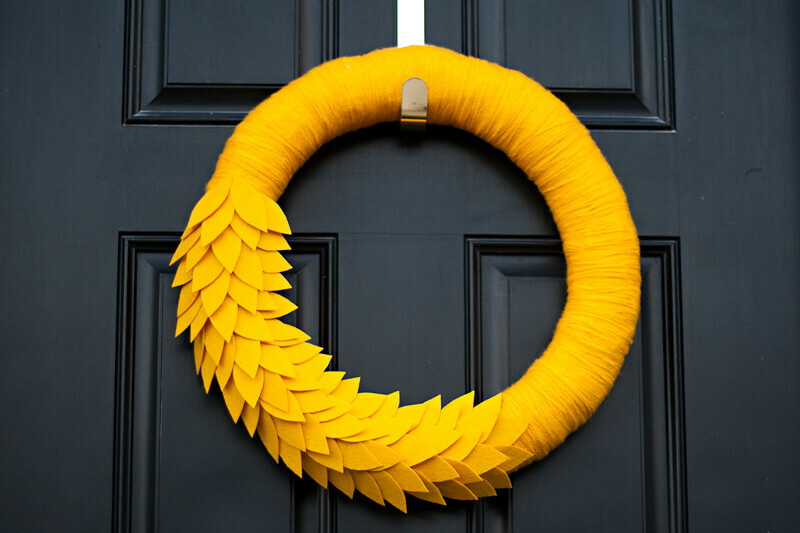 a modern, simple wreath. love it. This is beautiful!! I am SO going to make one! Thanks for sharing! I will give you credit on my blog when I finish! This is stunning! Did you cut your leaves to the same size each time? Did you start layering the leave from the bottom and work your way up? It is gorgeous! Love the look of this! Do you mind if I feature it/link back to on my blog? Would love to share it! Modern and gorgeous look. Love the felt material. Going to make non-woven fabric DIY for my house.